Mandibular nerve block is a safe procedure. The process of obtaining informed consent should include discussion of the risk of temporary numbness and paresthesia in the involved region. The mandibular nerve block has a success rate of 95%-98%, whereas the IAN block is successful in only 65%-85% of cases. The mandibular nerve is the largest division of the trigeminal nerve, with sensory roots from the trigeminal ganglion and motor roots from the pons and the medulla. The 2 roots exit the cranium via the foramen ovale and unite just outside the cranium to form the mandibular nerve. 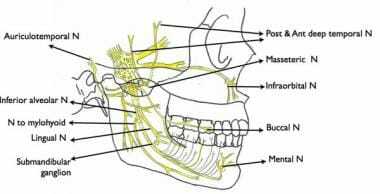 After giving off 2 branches, the mandibular nerve bifurcates into anterior and posterior divisions (see the image below). From the main trunk, the nervus spinosus reenters the cranium via the foramen spinosum to provide sensory innervation to the meninges. The nerve to the medial pterygoid is a motor branch that innervates the medial pterygoid muscle. It divides into 2 branches, which are the nerves to the tensor tympani and the tensor veli palatini. Sensory nerves from the anterior division include the buccal nerve, which is sensory to the mucosa of the mouth and gums and the skin on the cheek. The IAN descends into the pterygomandibular space along with the lingual nerve. Its sensory branch enters the mandibular canal and is sensory to the lower teeth and gums. It then exits via the mental foramen as the mental and incisive nerves, which are sensory to the chin and the lower teeth. The motor branch to the mylohyoid is given off before the nerve enters the mandibular canal and serves as motor supply to the mylohyoid muscle. Budenz AW, Osterman SR. A review of mandibular anesthesia nerve block techniques. J Calif Dent Assoc. 1995 Sep. 23(9):27-34. [Medline]. Gaum LI, Moon AC. The "ART" mandibular nerve block: a new approach to accomplishing regional anesthesia. J Can Dent Assoc. 1997 Jun. 63(6):454-9. [Medline]. Sisk AL. Evaluation of the Gow-Gates mandibular block for oral surgery. Anesth Prog. 1985 Jul-Aug. 32(4):143-6. [Medline]. [Full Text]. Gow-Gates G, Watson JE. Gow-Gates mandibular block--applied anatomy and histology. Anesth Prog. 1989 Jul-Oct. 36(4-5):193-5. [Medline]. Kafalias MC, Gow-Gates GA, Saliba GJ. The Gow-Gates technique for mandibular block anesthesia. A discussion and a mathematical analysis. Anesth Prog. 1987 Jul-Aug. 34(4):142-9. [Medline]. [Full Text]. Sisk AL. Evaluation of the Akinosi mandibular block technique in oral surgery. J Oral Maxillofac Surg. 1986 Feb. 44(2):113-5. [Medline]. Haas DA. Alternative mandibular nerve block techniques: a review of the Gow-Gates and Akinosi-Vazirani closed-mouth mandibular nerve block techniques. J Am Dent Assoc. 2011 Sep. 142 Suppl 3:8S-12S. [Medline]. Malamed SF. Is the mandibular nerve block passé?. J Am Dent Assoc. 2011 Sep. 142 Suppl 3:3S-7S. [Medline]. Vazirani-Askinosi technique (a.) point of insertion is medial to the mandibular ramus. (b) the needle is inserted till the hub of the needle is distal to the second upper molar.